Marc is a new client and together with partner Martine spent 10 days with us in Twizel recently. Wonderful settled and sunny weather was the norm for most of the time. Sunshine is all important for sight fishing so we could not have had better conditions albeit a little hot with four days in excess of 30°C. The cicada season was just kicking into gear for us and a few memorable fish were caught on imitations of this insect but as usual most of the trout were caught on nymphs or emergers. Drought conditions have reduced flows in many waters making for demanding fishing. The other down side is that trout released take more time to recover so extra care when handling them is required. 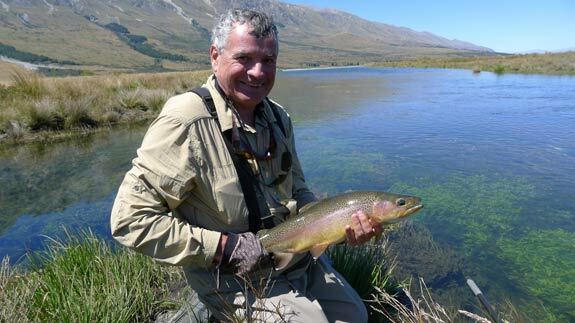 Another top quality rainbow for Marc Careful release - no harm done!